Do you eat organic foods? Organic food are those food that are mostly free from pesticides, chemicals, hormones and GMOs (genetically modified organisms). Although there is no organic food that is 100% free from pesticides, they are much healthier than normal non-organic ones. Since I am quite health conscious, I try to eat "organic" as often as possible. So when my friend invited me to lunch at an organic vegetarian food restaurant last Friday, I was more than willing to go! We went to this restaurant called Organic Recipe in Bandar Utama. In case you wonder, no, it has no relation with Secret Recipe, haha! 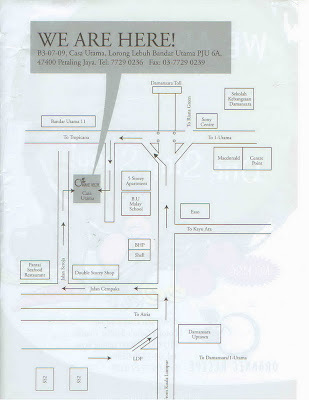 The restaurant is located inside the Casa Utama condominium. After parking my car in the visitors' parking lot, I looked for the staircase. There was a signboard telling me the direction to the restaurant. Walking down two flight of stairs, I reached Organic Recipe. My friend was not there yet, so I just walked around and shot some photos. I thought the ambience there was nice! These were the outdoor areas. As it was early, not many people were around yet. Those who were already there were sitting inside the air conditioned area. I decided to sit outside to wait for my friend as I just loved the relaxing ambience, with the sound of birds chirping in the distance. When my friend finally arrived, we quickly looked through the menu. I noticed they have specials lined up for the day which was not stated in the menu. Following my friend's recommendation, I ordered the Tom Yam Soup in Coconut, and the fruit rojak. My friend ordered the Special Fish dish, which was one of the "specials" for the day. See my giant tom yam coconut? They were very generous with the tom yam soup until the coconut was not big enough to contain all the soup! The extra soup was placed in a big bowl (behind the coconut in the above photo) which I passed to my friend, and there was a smaller bowl (the small bowl in front) containing the extra tom yam soup for me! This is how my giant tom yam coconut looks like up close! And my bowl of the extra tom yam soup filled with vegetables. No meat of course, as this is an organic vegetarian restaurant! I can tell you the tom yam soup was very nice! Just the right amount of spicy and sour tastes! And I liked the fact that I could scrape the white coconut flesh to eat too! In fact, I enjoyed the soup so much I finished all the soup until the very last drop! Yummy! At RM14.90, I think it's slightly on the high side, but still pretty reasonable as organic food are usually more expensive than non-organic ones. This is the organic fruit rojak I ordered. I really enjoyed this rojak! Very tasty with lots of fruits and delicious sauce. Totally satisfying to the last bite! Priced at RM7.90, I thought it was quite worth it, bearing in mind again this is organic rojak! I also tried a little of the Special Fish dish my friend ordered. See the pieces of fish on top? For a minute, I thought I was eating fish, and then realized this was a vegetarian restaurant! Haha! So it was not real fish, but it tasted pretty good! This special fish dish costs RM13.90. I think I still prefer my tom yam soup! Both my friend and I called for a bowl of brown rice each to eat with these dishes. Surprisingly, they did not charge us for the 2 bowls of rice! I was not sure whether they had forgotten, or it was supposed to be free! Well, I did not bother to ask! haha! We both also ordered a glass of passion fruit juice each. I ordered with ice whereas my friend ordered without ice. Normally, I do not order my drinks with ice because I feel a lot of restaurants try to short change you with lots of ice and very little of the drink. But for this restaurant, I was surprised that my iced drink came in a bigger glass than my friend's. Not bad! Priced at RM3.90, it was quite a delicious and refreshing drink! The total bill for both of us came to RM44.50 with only an added 5% service charge. I was quite happy with my meal here. Definitely will come here again! Orgaic vegies are expensive in Singapore. But they are available everywhere. There are restaurants serving only organic food and the dishes are not cheap. I'll just buy the organic vegies and cook at home. The restaurant looks very cozy. The food looks nice too. The portions are quite big eh. Looks delicious. I never had organic food. Those food which is not organic is actually "chemical"
I was told too that there's not 100% organic food as the water source's not entirely pollution free. We eat as healthy as we possibly can by making healthy choices. You have an organic theme here today...which kinda coincides with mine too but I have yet to post stories about my organic adventure over the weekend. LOL this post came right after I laughed at my Mom's look of horror when she discovered the 2 small (really small) packets of beans she bought at Giant cost Rm3.50 each, reason being "organic". I'm still skeptical that Msians truly offer organic foods after so many reports of normal vegetables being sold at higher prices under the pretext being "organic". So you are very organic huh Foong. :D Well...I only eat organic foods sometimes. The restaurant ambience is really good. I agree with you. From your shots it looks really spacious. Organic food is not really good for the environment, unless you grow your own veggie! Organic farming has low yield, so more land is required to produce the same amount of food. The solution? Clear the forest! You can read more about this topic in my post. We buy organic vegetables most of the time and considering how some of the markets here overcharge us for regular vegs, the prices are about the same! We decide to go organic mostly because of the taste. Most organic vegs are tastier and does not have a bitter taste that usually results from pesticides. Of course the best ones are the homegrown ones. I'd usually get some homegrown veg from my relative who always have plenty of vegs they can't finish. The vegs are go good and fresh, I can even eat the ladies fingers raw straight from the plant! The rojak looks really delicious! I have a problem with the organic vege because there are plenty of worms inside, it spoils my appetite. If more people were to eat organic food, the price will come down. Unfortunately, not many people eat organic food although more and more people are starting to be more aware of the health benefits of eating them. borneo falcon, no organic food at your place? It's good to try it - you can feel the difference! anton, haha! Well, I think it's better to buy your organic stuffs from reputable organic shops. No need to buy everything organic, only those fruits and vegetables that are heavily sprayed with pesticides. I recommend buying organic apples, for instance and not dragon fruit, cos dragon fruit is relatively easy to grow without too much problems with pests. Whereas apples are top on the list of fruits with most pesticides residues. Also avoid non organic watermelon and honeydew - these are difficult to grow without the use of chemicals and pesticides. khengsiong, I have read your post and the article you linked. Interesting! I guess it's better to plant your own veggies then! I think it's best to buy organic produce locally at the nearest organic farms instead of imported ones cos most organic products cannot last long. Unfortunately, in Malaysia, there's no system to certify if the veggies we buy are really organic or not! foong speaks her mind, wow! You pay the same price for non organic veggies? Then might as well buy organic veggies, right? You are right about the taste. I also love the taste of organic veggies. So much sweeter and more delicious! merryn, yeah give this organic restaurant a try - I think you will love it! The difference between organic and non organic veggies and fruits is that the organic ones are tastier and sweeter. molly, yes love the rojak! In fact, craving for it right now! haha. i do eat organic foods, especially homegrown vegetables that are not treated at all with any fertilizer nor any pesticide. the taste of freshly harvested vegetables is so different than a few days old. Sounds like an interesting place to go to. Wonder if I should visit my friend one day. I've started consuming organic supplements a few years ago to help maintain my well-being and I feel that my family and I benefit from this. the food looks heavenly esp the fruit rojak. we also eat organic foods, it's healthy but quite pricey here most esp veggies...imagine a bell pepper is $1 each unless there's a deal. Nice tasty looking afoods...great shots foong...i bet and convinced those are yummy! The food looks so good! I wish they sold more organic food here. Sometimes I find it hard to eat out because I am a vegetarian. At first sight, when I saw the logo I thought it was a "Handicapped This Way" sign lol. But wow.. the Tom Yam soup looks good! Appetizing! Yummy! I am never a vegetarian meat eating person... afterall I find there is a lot of MSG in it to make it nice. But the Tom Yam still looks good! Its interesting to find organic food that is cooked to the ASIAN flavour. I don't recall we have that here in sg. Organic food here are mostly western. my parents plant plenty of organic vege/fruits at home! but too bad i am always not home to enjoy them. sigh. and wat u said is right, if we eat out, we can never know we r really paying for real organic food or not. This is quite an elegant place to eat. The food looks great too. Nice ambience. Is that raw brinjal, the purple pieces in the fish dish? Come to think of it, the whole dish looks raw. Pls enlighten. And the rojak.... looks yummy. angie tan, friend? Your friend is the boss at Organic Recipe or working there? eastcoastlife, yes I agree it's pretty costly. But when people eat all the inorganic food and gets sick, the medical bills are not exactly cheap either! life ramblings, you take organic supplements? Which brand? I still prefer to take organic vegetables and fruits rather than supplements although they can be useful. ladyviral, you are right. Actually the vegetarian "meat" is not really that healthy. I prefer to eat normal organic vegetables and not vegetables made to look like meat. a common singaporean, no organic food cooked in Asian style in Singapore? I'm surprised! I thought Singapore should have Asian organic food! xin, wow! What a waste! Quick! Go home often to eat your home grown organic vegetables! happysurfer, yes the ambience there is nice. I'm not exactly sure about the purple pieces whether they were brinjals. I only tasted the fish and some of the vegetables. No, it's not raw dish. Though they were not as overcooked as the vegetables in my tom yam soup. neo, go and try it, but warning - no pretty models there for you to snap pictures lah. LOL! We dun have a organic restaurant over here but we do have lots of organic shops around! i'm taking the organic supplements in the form of capsules from Alterni. organic vegetables and fruits are beneficial too but i think they can be quite pricey as well. the first thing that reminds me of organic food is magaret from phua chu kang.. she's always talking about organic food.. haha..
life ramblings, I heard of Alterni! The CEO is Rajen M, who wrote many health articles in The Star paper, right? kenwooi, haha! Yes I remember about Margaret from Phua Chu Kang! Was checkin out yr entry on this plc!Wanna go soon! You know what, I really loved organic foods. My sister usually drove me to an organic restaurant here in Australia, but seems like its a lot waste of time, rather than to have an organic food delivered directly to our house, I just cooked it and the whole family can enjoy. Me and few of vegetarian my friends are planing a CNY gathering soon and we are trying to choose the suitable restaurant for this event. We are actually struggling between "Organic Recipe" and "Chef Low Organic Kitchen" ....which one you prefer, after visiting both? They are quite near to each other, right?